Polaris Marketing Research, Inc. is celebrating 20 years of delivering quality customer service to their clients. While Polaris has exceptional strengths in long-term tracking research, we also conduct many ad hoc studies to help our clients with strategic and tactical decisions. The basis for all of our work is stringent quality control and focusing on the decisions and actions that our clients will take from the results. 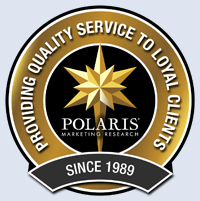 Polaris Marketing Research, Inc. (polarismr.com) announced today that it is celebrating 20 years of delivering excellent marketing research and quality customer service to loyal clients. In recognition of this accomplishment, Polaris has posted a quality service seal to their website. "Twenty years is a significant accomplishment for any business. However, for Polaris what is most noteworthy is that we still work with some of our original clients. Through mergers and acquisitions, seasonality and business cycles, we have provided valuable and actionable information to help clients understand and keep their customers for the long-term," said Polaris founder and president, Jan Carlson. Polaris's diverse client base represents companies in business-to-business and business-to-consumer enterprises, in for-profit and not-for-profit organizations, and in many different industries. Senior vice president Debra Semans said, "While Polaris has exceptional strengths in long-term tracking research, we also conduct many ad hoc studies to help our clients with strategic and tactical decisions. The basis for all of our work is stringent quality control and focusing on the decisions and actions that our clients will take from the results."